Are you looking for unique, space saving, solution to display retail products or collectibles and heirlooms in your home living room? These corner display cabinets are a fantastic way to expand counter space when shopfitting any retail store, and larger curio style fixtures compliment home decor while protecting valuables in style. Take advantage of solid wood curio construction to accent existing furniture in your family room, living room, dining room, or study. 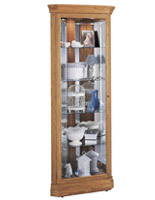 These corner display cabinets are offered in multiple elegant and stylish finishes; sure to complement almost any décor, from traditional to modern, and anything in between. The glass curio cases featured above are small enough to use minimal floor space, yet large enough to be noticed and exhibit some of your most prized possessions. Use a corner display cabinet in any retail environment to accent existing store fixtures, shopfit sales floors, and protect valuable merchandise from damage or theft. These retail fixtures are durably constructed using aluminum or medium density fiberboard (MDF) frames and tempered glass panels that are specifically designed to maintain their appeal through heavy use in high-traffic environments. 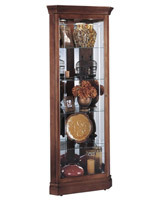 At home, these corner display cabinets are expected to last even longer, and can become a permanent fixture in your household where valuable heirlooms can be proudly showcased for all to see! Do these cases require assembly? Although many of these wood and glass furniture pieces are shipped assembled, the glass shelves have to be installed. The Howard Miller curio cases with lights need only be plugged in, and the shelves set according to personal preference. What are the delivery options available for these showcases? 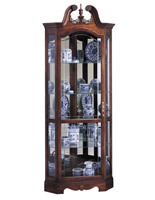 All of these wood china cases ship via freight, with a few shipping features offered. This corner showcase can be shipped dock-to-dock, lowered to ground level, two steps inside the doorway all for free (for Howard Miller Cases only). 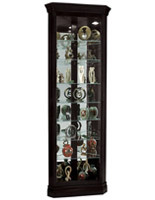 We offer a number of style options, such as extra vision glass showcases and curio display cabinets. Our corner glass fixtures are ideal for retail environments, featuring sturdy aluminum frames and extra vision glass panels that maximize product visibility. For home, we suggest browsing our selection of curio display cabinets to find the perfect high-quality fixture for your home that will prove to be a timeless piece of furniture. Many of these corner showcases feature such things as; top lighting, front access doors, floor levelers, and adjustable glass shelves. 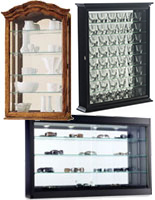 While curio display cabinets are ideal as standalone fixtures, many of our counter-height extra vision cases are designed to compliment other products available on our site. Shop from selections in our IE Series or Essentials Series to mix-and-match similar cases to create a cohesive, matching, cash wrap in your retail store. Take advantage of products from the same series to build unique merchandising presentations and outfit your shop in style.